October 1st Dance of the Month | The New York Baroque Dance Co.
All Hallow’s Eve/All Saints Day, El Dia de los Muertos, holidays built upon a universal human need to embrace the mystery of the life-death and rebirth cycle, as well as to honor ancestors and departed loved ones. 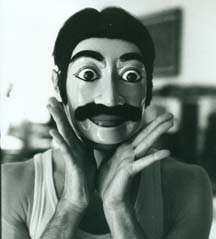 Carlos Fittante, former company member with the New York Baroque Dance Company and artistic director of BALAM Dance Theatre, a contemporary dance company inspired by Balinese theatre, will conduct a movement class combining Baroque dance with Balinese mask work. Class participants will be lead through a fun and imaginative movement exploration in expressing archetypal patterns. No previous background in these skills required.